I got duplicate rows in the fact table. How do I handle it? The rows with that snapshot date already exist. What should I do? Lookup cache: should I choose full cache or partial cache? Customer: contains 100 customers, e.g. name, data of birth, telephone number, etc. A column called CustomerId uniquely identifies a customer. Van: contains 20 vans that Top Hire operates. It’s their fleet. Contains the registration number, engine size, van size, colour, year of manufacture. The unique identifier for each van is the registration number. Hire: contains 1000 hire transactions since 1st Jan 2011. Every hire transaction stores: who the customer was, which van was rented out, the date it occurred, number of days and various hire fees/charges (the van, sat nav, insurance, damage waiver and total bill). For each transaction we have Hire ID, which is a unique identifier in this table. Date dimension: contains every single date from 2006 to 2016. Customer dimension: contains 100 customers. To be simple we’ll make it type 1 so we don’t create a new row for each change. Van dimension: contains 20 vans. To be simple we’ll make it type 1 so we don’t create a new row for each change. Hire fact table: contains 1000 hire transactions since 1st Jan 2011. It is a daily snapshot fact table so that every day we insert 1000 rows into this fact table. So over time we can track the changes of total bill, van charges, satnav income, etc. So now we are going to create the 3 tables in HireBase database: Customer, Van, and Hire. Then we populate them. So now we are going to create the 3 dimension tables and 1 fact table in the data warehouse: DimDate, DimCustomer, DimVan and FactHire. We are going to populate the 3 dimensions but we’ll leave the fact table empty. 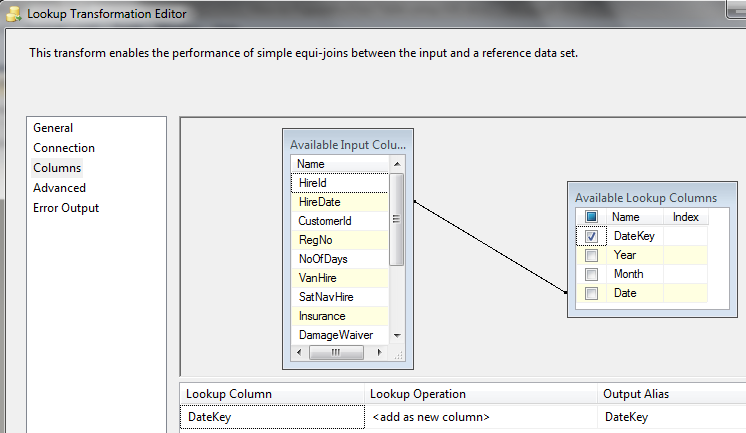 The purpose of this article is to show how to populate the fact table using SSIS. Now you can see that the 3 dimensions have been populated. And the fact table is created and empty, ready for us to populate it. Read Hire table in HireBase: First we get the original OLTP records from the hire table in HireBase. Get Snapshot Date Key: we get today’s date and convert it into an integer as Snapshot Date Key. FactHire is a snapshot fact table. A periodic snapshot fact table. Which means that every day we populate the fact table with 1000 rows like this:Next week, on Monday 28th May, we insert 1000 rows to the fact table, which is all the rows in the Hire table. Then on Tuesday 29th May we insert 1010 rows. Because there would be 10 new hire transactions in the Hire table in HireBase system. The 1000 “old” rows might change as well on Tuesday, not all of them will be the same as Monday. Perhaps there are 10 rows which are modified, the amount/fees changed, etc. Whatever the condition of the Hire table on Tuesday, we are taking all rows in put them into our data warehouse. And we do this every day. We every day, put whatever is in the Hire table into FactHire. That’s what Periodic Snapshot fact table means.Hence in a periodic snapshot fact table we have a “Snapshot Date”. Meaning: the date when we captured the source table. Or, the date when these 1000 rows were inserted into this fact table. The value of this snapshot date is today’s date (the date the ETL runs). The date the load happens. Get Customer Key: from Hire table we get the Customer ID which was involved in the hire transaction. We then go to the Customer Dimension to get the Customer Key for this Customer ID. Get Van Key: from Hire table we get the Registration Number which was rented out in the transaction. We then go to the Van Dimension to get the Van Key for this Registration Number. Get Hire Date Key: from Hire table we get the Hire Date, which is the date when the hire transaction happened. We then go to the Date Dimension to get the Date Key for this Hire Date. Populate FactHire: After we get all the required dimension keys, we insert the rows into the FactHire fact table. Now that we know what to build, let’s build it. The box numbers below refer to the 6 boxes above. Full cache: SSIS reads all rows from DimCustomer into memory, then read the Hire table and SSIS doesn’t need to read DimCustomer any more. All lookup operations are done in memory. Partial cache: SSIS build the memory cache while reading the rows from Hire table. When SSIS reads the rows from Hire table, it tries to find the Customer Key in memory cache. If it can’t find it, it reads the DimCustomer on disk. No cache: SSIS doesn’t build memory cache. 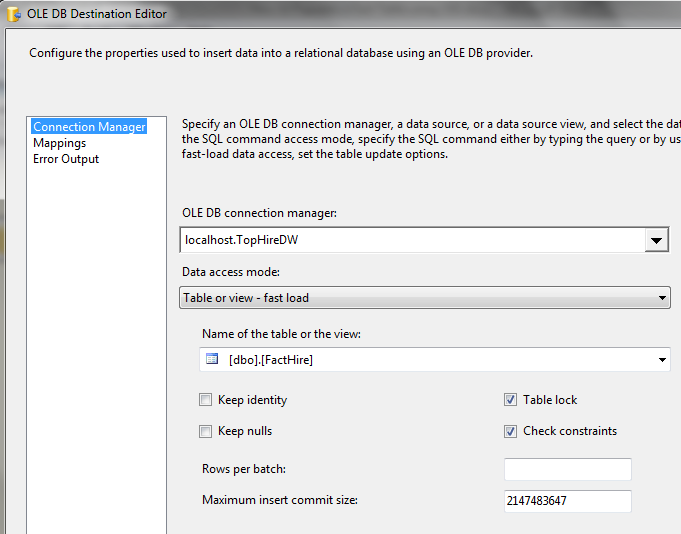 SSIS joins DimCustomer to Hire table (using RDBMS operation) to find the Customer Key. 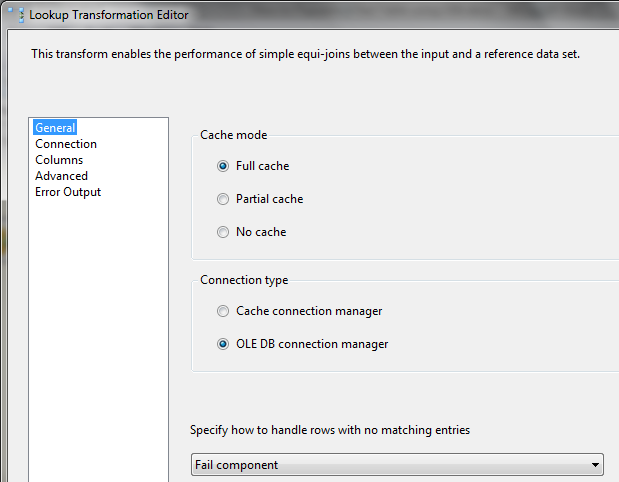 Cache Connection Manager (CCM): SSIS reads DimCustomer and put in memory cache. This cache can be reused and shared between several Lookups, and across several dataflows. CCM reduces database workload. It’s the same as Get Customer Key above, i.e. using Lookup transform. When connecting [Get Customer Key] and [Get Van Key] choose Lookup Match Output. I’ll come back for Lookup No Match Output at the end of the article. I just want to get this up and running first. We should always get a simple one first up and running, then build up from there. It’s the same as Get Customer Key above. The 4 dimension key columns are populated with the surrogate key from the respective dimension. If in the Hire table we have a CustomerId which does not exist in the Customer Dimension, we need to set the CustomerKey to 0. If today’s rows exists in the target fact table, delete them first. As this is long enough. I’m going to put it as a separate article (link). Thank you to Masu for pointing this out. This is because on the Hire table (the input), the HireDate column is in date data type, whereas in the DimDate table, the Date column is in varchar(10). then, if I wanna populate my fact table, can I use like what you explained above? I rather confused about column ‘SnapshotDateKey’ of FactHire fact table…why you create it? Hi ita, yes you can use the above technique that I explained to populate your fact table. The ‘SnapshotDateKey’ column in the FactHire fact table is to differentiate the day of loading. Every day we load all the rows from the source table into this fact table. For yesterday’s load, the SnapshotDateKey column would contain 121001 (1st October 2012) and for today’s load, the SnapshotDateKey column would contain 121002 (2nd October 2012). Please read Kimball & Ross’ Dimensional Modelling book chapter 2 about “periodic snapshot fact tables”. ok Mr. Vincent…after I read and understanding your tecnique here and on your ebook, I get what you mean. Thank you for pointing it out Masu. I have explained this at the end of the article above. Your write up is very good, I just have one problem with my DW. I am curious why your source is a table from the staging area in your fact table loading sequence (table “Hire”). In my case, I have 3 populated tables in my staging area, 4 populated tables in my DW area and a blank fact table with all proper columns. When I use my “Fact-sales” as the source and destination table, the lookup processes run succesfully but do not populate my fact table. Also, in my destination table, when I look at mappings all of my source mappings are in format “lookupsequencename.columnname”… What am I missing? its really really helpful. thanx alot..
Hi Vincent, this is a very good tutorial, but I got a problem in Get Hire Date Key. That makes me stuck to this Part 1 and couldn’t get my self to the next part of tutorial. 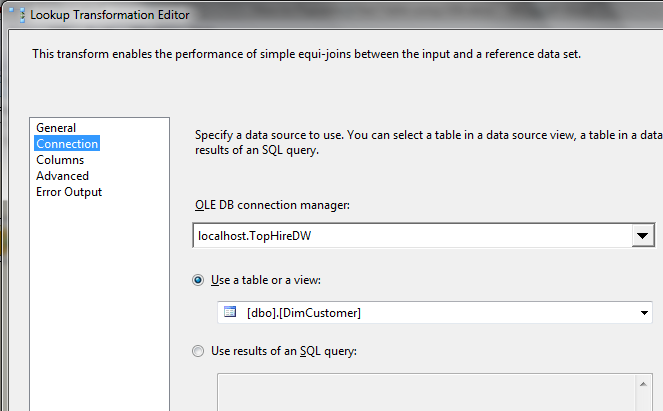 Like u said before, use SQL query not table or a view. I’ve already used your code but theres error message said “Conversion failed when converting date and/or time from character string”. Is there something that I can do to fix this problem? The error message appears when I pressed Preview on Lookup Transformation Editor, for the “Get Hire Date Key”. One of the row in DimDate contains the word ‘Unknown’ in the Date column so it can not be converted to Date, resulting in the above error message. I hope this was the issue, if not please get back to me. 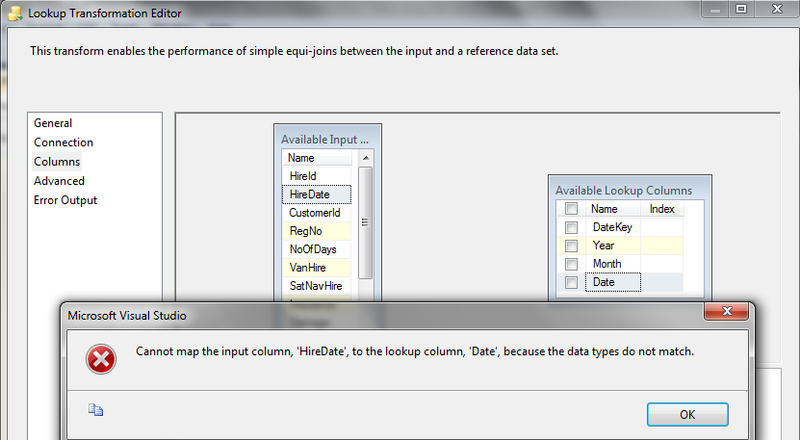 This article is very good, but as a beginner in SSIS and OLAP I got lost just at “Box 1. Read Hire table in HireBase”. Can you please give details as to how about you get the OLE DB source Editor screen. I opened SSIS in BIDS, did new project, selected Integration Services project. Click on DataFlow tab, double click on OLE DB Source. I get the following error “The Data Flow object could not be added. 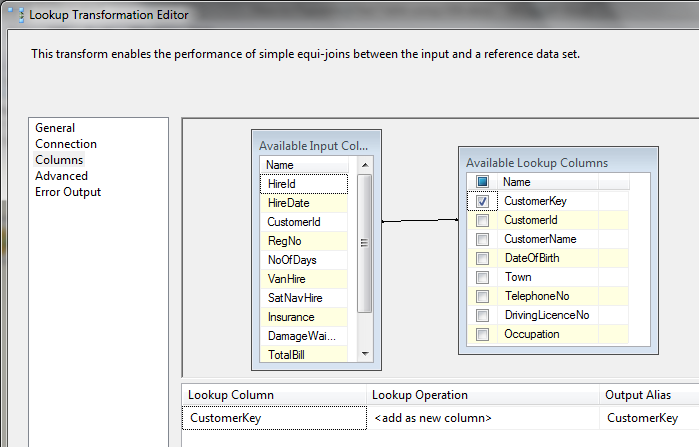 Data Flow object can only be added to a Data Flow task. Open Business Intelligence Development Studio or SQL Server Data Tools, create a new SSIS project or open an existing SSIS project, click Data Flow Task on the left hand panel (SSIS Toolbox) and drag it to the Control Flow tab. Double click this Data Flow Task icon and the tab will automatically switch from Control Flow tab to Data Flow tab. 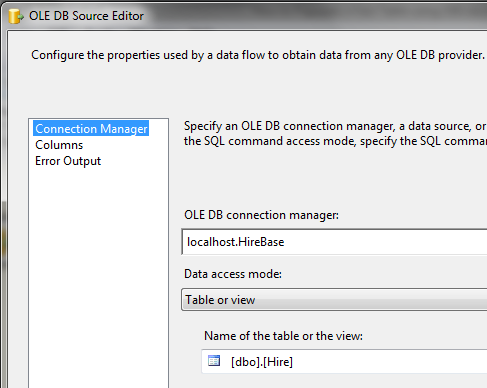 Look at the “Source” section of the SSIS Toolbox and find OLE DB Source. Click it and drag it to the Data Flow tab’s canvas. Thank you Vincent. Much appreciated for your help. Hi Vincent, Excellent Article! Would you recommend any article which at the Step1 of creating Fact tables follows Insert/Update Logic rather than complete snapshot ? ( Insert if exists else Update if any existing records have been changed) . Thanks in advance. 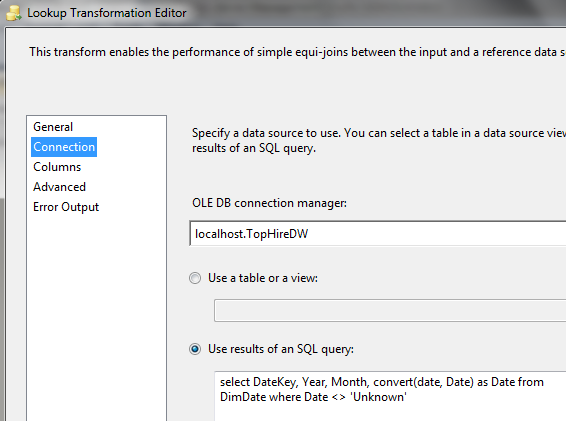 Hi Robbie, no I don’t know any article which explains the details of how to upsert into a transactional fact table, using SSIS or other ETL tool. Transactional fact tables (rather than snapshot fact tables) are inserted but not updated. This is because if we update, it would take a long time. But suppose that your fact table only contains 100k rows, or even 1m this is possible (I’d expect update on 1m rows to be about 5s). I think the best way is to use manual upsert command using Execute SQL Task. I don’t like using Merge command, nor SCD Wizard, because of their performance. To support this update SQL command, the fact table needs to have an index on the composite PK. The widely-adopted SQL Server indexing technique of a single-column PK with identity being a clustered index, plus a non-clustered index on the dimkey columns are sufficient to support performance. I believe a more superior performance can be achieved by clustering on the dimkey columns, with negligable performance overhead on the insert operations (the issue with this approach is more of functional one than performance: duplicate PK occurs when when we insert a second row with the same dimkeys — so I would recommend the first approach above). What an amazingly concise but very effective guide, using straight to the point and meaningful examples! People who write books/papers tend to use examples they have become aquatinted within in a work environment/subject, which often results in the reader being lost. This gives great examples on how the fact table should look (albeit basic), i.e not too different to the OLTP main table. It also conveys how the fact table should interact with the dimensions as opposed to an OLTP environment i.e Star over e-r modelling. Thanks! Hi, I did not create the foreign keys (FK) hence in the database diagram it is not a star. I prefer not to create FKs in the warehouse, but manually control and check it from the ETL & DQ, because FK could cause performance issues. For example when deleting rows from dimensions, or updating the surrogate keys on the dimensions or bridge tables, also if the dim keys on the fact tables are left as null because they are late arriving fact rows. Excellent article ! Steps are so easy to follow and the concepts have been explained clearly. Thanks for posting. It depends on which column is null Seyi. If an attribute or measure column is null then we let them stay as null in the warehouse. If a natural key is not found in the dimension then we map it to the unknown row by setting the dimension key to 0. What do you mean by null exception? (I have a feeling you meant different thing). – Specify how to handle rows with no matching entries: it is set to “Redirect rows to no match output”? – Is the Mismatch Insured box a Derived Column transform? 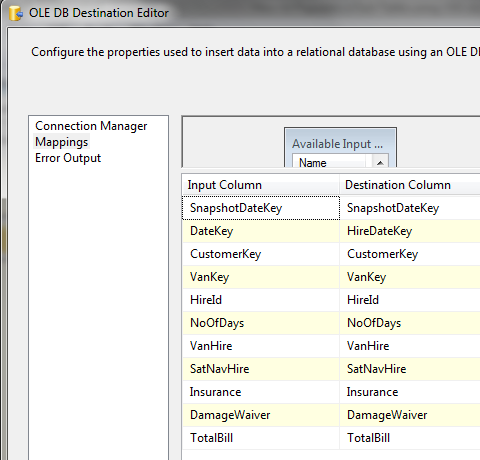 – In the Mismatch Insured box, is the Derived Column Name column set to Insured Key? – In the Mismatch Insured box, is the Expression column set to zero? – Is the output of Mismatch Insured Box going to a Sort box? – In the Sort box, is the Input Column set to Insured ID?